I have a confession. I am crazy for kale. Kale chips, steamed kale, and of course, this Summer Kale Salad with Creamy Lemon Tahini Dressing. Seems like my neighbors love kale too. I see kale at Farmer's Markets and menus across Southern California. Everywhere I go, there kale is. So why is everyone so obsessed with this leafy green? To start, kale is really versatile. Chop it up fine and add it as a crispy topper to any salad or soup. Toss the leaves with coconut oil, garlic powder and salt and bake at 350 degrees F for 15 minutes and you have a crispy kale chip snack. Sauté with ghee, onions and garlic for an all-purpose, nutrient dense side dish. I could go on an on. But even better is kale's impressive nutrient profile. 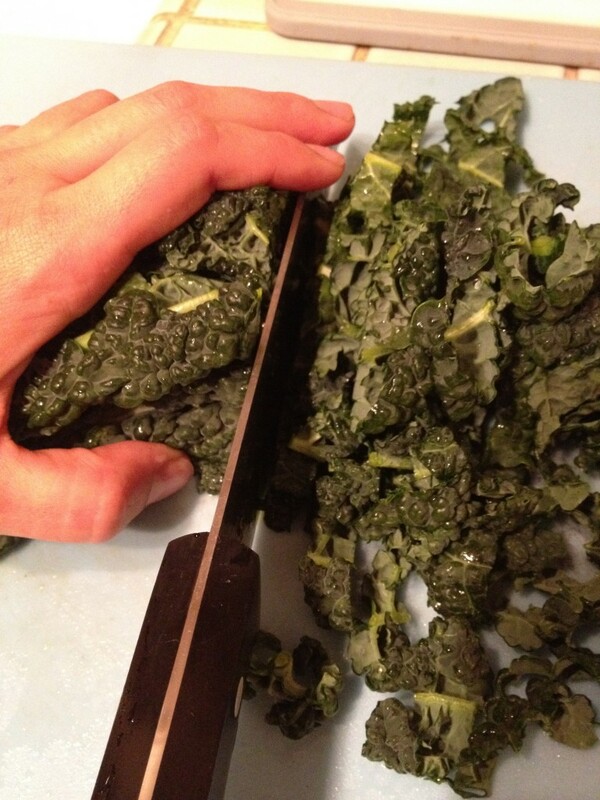 Keep in mind that lightly steaming kale or otherwise helping to break down (e.g. massaging - see below) some of its cruciferous fiber will aid your body in digesting kale more easily and better absorbing kale's awesome nutrients, especially when combined with healthy fats (to unlock the fat soluble vitamins). High in fiber. One cup of kale has 5 grams of fiber, which aids in digestion and elimination. High in Vitamin K. Vitamin K has shown to support bone health, mental function and the prevention of blood clotting. Lots of powerful antioxidants. Antioxidants, such as carotenoids and flavonoids, have been shown to help protect against various cancers. Anti-inflammatory. One cup of kale is filled with 10% of the RDA of omega-3 fatty acids, which help to fight against arthritis, asthma and autoimmune disorders. High in Vitamin A. Vitamin A is great for your vision and your skin, and has been shown to prevent lung and oral cavity cancers. High in Vitamin C. Great for your immune system, your metabolism and hydration. Detoxifying. Kale is filled with fiber and sulfur, both great for detoxifying your body and keeping your liver healthy. So kale is a nutrient powerhouse? Awesome! And it tastes good? No wonder this leafy green is the talk of the town and a key ingredient in my kitchen. This Summer Kale Salad has become a staple in my house. It's a snap to make and really filling - perfect for those nights where you're worn out from a long day but still want a hearty, nutrient dense meal. Need a quick dish to bring to a summer barbecue? Colorful and delicious, Summer Kale Salad is a refreshing compliment to balance out a party spread and is sure to get at least a couple glowing reviews. Summer Kale Salad is best made with the slightly more tender lacinto kale (dino kale), although I have made it with the traditional kale variety and it was still good. Before you add your fruit and nut toppings, you want to take the time to really massage the Creamy Lemon Tahini Dressing into the kale to kickstart the breakdown of some of the fiber. This will make your salad softer to eat and easier for your body to absorb all of kale's awesome nutrients. Sometimes I will massage the kale with the dressing before I leave for a party, and then just throw on the fruit and nuts right before serving. The recipe below is my favorite iteration, but I've had success in switching up the fruit and nut combinations as well. Dried cranberries, plums, toasted sunflower seeds, pumpkin seeds and pecans have all been delicious. Summer Kale Salad with Creamy Lemon Tahini Dressing is a bright and colorful addition to your summer barbecue spread. Wash and dry kale and cut off stems, about 3-4 inches from the bottom. Bundle the leaves together and cut across the stem into strips about 3/4 inch wide. In a medium bowl, toss kale strips with Creamy Lemon Tahini Dressing and massage with your hands. You want to use your fingers and palms to really work and squeeze the dressing into the leaves. Let rest 15-20 minutes. Coarsely chop walnuts and toast in a small cast iron skillet over medium heat for 5 minutes or until very lightly browned. Wash strawberries, remove stems and dice into 1/2 inch cubes. 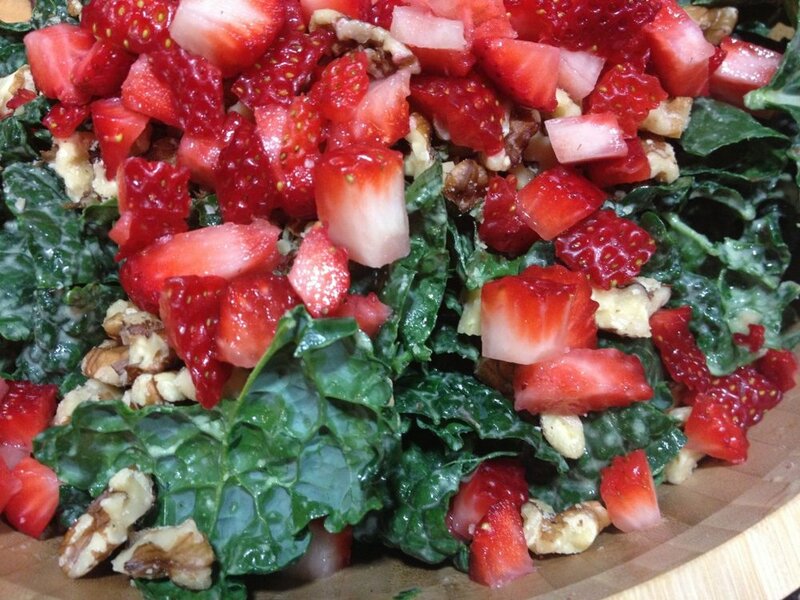 Sprinkle strawberries and walnuts over kale salad and serve.